Soft Cover, 295 pages, 5.5 x 8.5. Discover what makes the heavenly brews of Belgium so good in this new book by long time Real Beer Page Editor Stan Hieronymus. In Brew Like a Monk, he details the beers and brewing of the famous Trappist producers along with dozens of others from both Belgium and America. Sip along as you read and, if you feel yourself divinely inspired to brew some of your own, try out the tips and recipes as well! "Like a favorite uncle passing down family tales and beloved recipes, Stan Hieronymus blends humor, a reporter's eye and a vast knowledge (his own and others') of brewing and Belgian beers into a tasty concoction that is not only informative, but also entertaining. 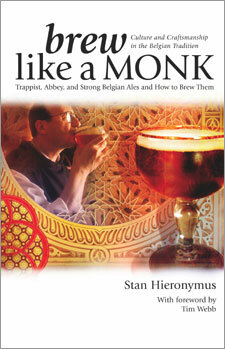 "With Brew Like A Monk, Stan Hieronymus takes an engaging snapshot, capturing the present tense in the rich heritage of monastic brewing. The revealing details do not detract from the artistic side of brewing, but, instead, serve to increase the sense of wonder regarding these elegant beers." The hunt for answers to these questions begins in Belgium by considering the history of monastic brewing and the environment in which Trappist breweries first operated. This book examines how the pioneers brew, and also how other brewers in Belgium make similar beers. It includes visits to seven essential breweries. Because only six Trappist monasteries brew, and they package but fifteen beers for sale, we can focus on the breweries and each of those beers, then consider the others they inspired. The seventh brewery? The Moortgat Brewery where Duvel was born. Still more Belgian breweries are profiled befor we ask American brewers producing Belgian-style ales answer the same questions put to the Belgians. Then the book details the ingredients available to American brewers and how to use them. The goal, of course, remains to brew these beers successfully. Thus, the last chapters deal specifically with the concept of styles, offer tips for professional and amateur brewers, provide specific information about what works, and conclude with recipes and the thinking behind them. Stan Hieronymus is the editor at RealBeer.com and one of America's leading writers on beer and brewing. In 2004 he was given the inaugural Brewers Association Beer Journalism Award in Trade Media and he is also the 1999 recipient of the Beer Writer of the year award. His previous books (all co-authored with Daria Labinsky) include Beer Travelers Guide, Time-Life Brewpub Cookbook, Beer Lovers Guide to the USA, and Frank Applegate of Santa Fe: Artist and Preservationist. He continues to update information about monastic beers at www.brewlikeamonk.com and muses (almost) daily on other matters of beer at www.beertravelers.com/postcards.